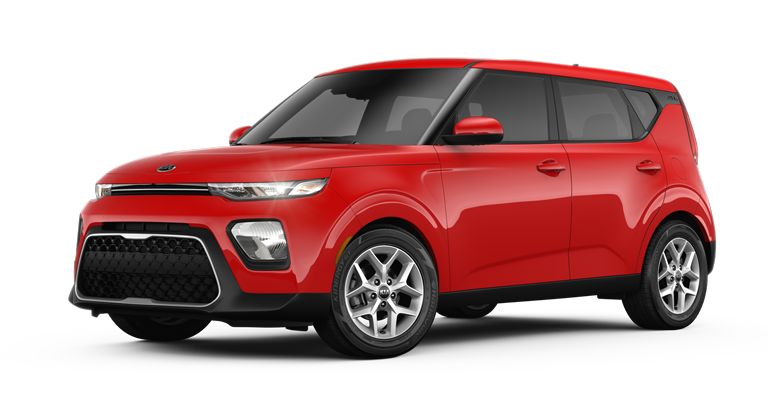 The base model of the 2020 Kia Soul is the LX trim equipped with a manual transmission. The good news for those who like to row their own gears is that power is up from the previous generation Soul, from 130 horsepower and 118 pound-feet of torque in the 2019 model to 147 horsepower and 132 pound-feet of torque for 2020. That’s a sizable increase, especially since the curb weight of the base model Soul has been reduced by 80 pounds, from 2,884 to 2,802. For the $17,490 base price tag you see on the Kia website (which comes out to $18,485 with destination charges), you have just one option to choose from: a standard silver with a black cloth interior. You can pay an additional $345 to get your manual Soul in white or black, but there’s no other interior choices. The bad news for people who opt for the stick shift is that the car is as bare bones as they come in this day and age, with almost everything that looks like a button in the car replaced with blank pieces of plastic. Kia has even taken out the center armrest and cruise control, and you have to make do with unpainted black exterior mirrors and door handles. Plus, the manual Soul doesn’t have keyless entry. So if you’re ready to go back to the days of putting a key into your door every time you walk up to your car, then you’re ready for your stick shift Soul. If you do decide to opt for the automatic transmission, which is a continuously variable transmission Kia calls the IVT, you get a whole lot more standard and a whole lot more choice, even in the LX model. The automatic transmission pushes the price of the Soul LX by $1,500 to $18,990 plus the $995 delivery fee ($19,985 total). For this extra $1,500, you get body colored outside mirrors and door handles, although the wheels are still 16” steel wheels with plastic wheel covers. I do have to admit that the wheel covers are a nice design. On the inside, you get cruise control and a Drive Mode selector that’s absent on the manual transmission car. And yes, you do get keyless entry. When you get the automatic Soul LX, you also unlock a handful of more interesting color choices, including a cool bright yellow, a red-orange called “Mars Orange,” a bright red, and a sophisticated dark gray. For some reason, you still have to pay $345 extra for white or black. Stepping inside, you can select an attractive gray two-tone interior instead of the standard black interior at no additional cost. All Soul LX models feature auto on/off headlights, tinted windows, a 7” color touchscreen mated to a 6-speaker audio system that features Android Auto and Apple CarPlay, and auxiliary and USB inputs. Notably missing on all Soul LX models are safety features such as blindspot monitoring and collision avoidance. If you want those driver aids and more upgrades, you need to start looking at the Soul S.
The Soul S takes the basics from the Soul LX with the CVT and adds some creature comforts. 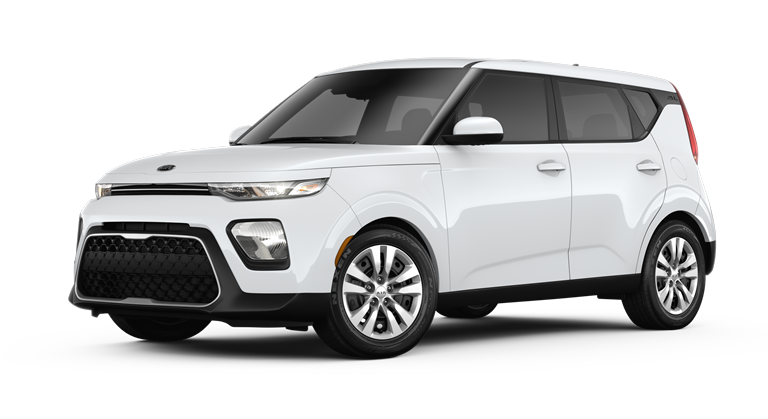 Available in all the exterior and interior colors listed for the automatic LX, the Soul S adds $1,300 in price over that model to bring us to a total of $20,290 ($21,285 after destination fees). For your $1,300, expect to find a set of good-looking 16” alloy wheels and a host of safety features including Forward Collision Avoidance, Blind Spot Monitoring with Lane Keep Assist which will proactively steer your car if it sees you drifting out of your lane, and Rear Cross-Traffic Alert. 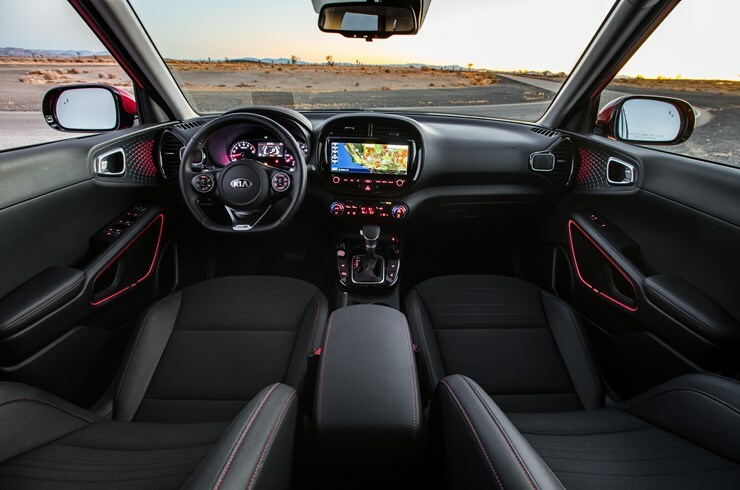 Kia also claims that the cloth interior of the Soul S is a premium Tricot material which is more comfortable and sturdy than that in the base Soul LX. The Soul S also requires a $345 premium for the white and black exterior colors. Whatever you do, don’t expect the Soul S to feel sporty when you test drive it at the dealership – it doesn’t. 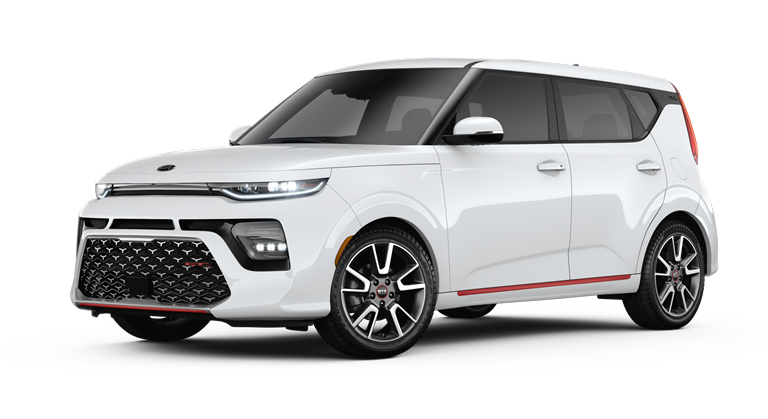 Kia made an interesting decision to create a more basic GT-Line model for the 2020 Soul which has all the go-fast looks of the turbocharged model without that go-fast engine. What this allows you to do as a buyer is to put the GT-Line’s aggressive body kit and sharp 18” machined alloy wheels on your driveway while paying no more than you would for a Soul S.
The GT-Line starts at $20,290 ($21,285 after destination fees), which is the same as the S. Additionally, it offers some cool exterior two-tone paint options: white with a red roof, black with a red roof, or red with a black roof. These options, along with the standard white and black paint, require that same $345 price bump, but you can still get the GT-Line in a bright red, a bright blue, or a dark gray without paying extra. All GT-Line models come with sporty gloss black exterior mirrors and front foglights that you won’t see on the LX or S. Additionally, all GT-Lines that we’ve seen so far come with the red trim on the front bumpers and side skirts, although in Kia’s online configurator, those red accents are mysteriously missing from the pictures. On the inside, you’ll find that the GT-Line only comes with a black interior, but it’s that same premium Tricot cloth trim that you find in the Soul S. You’ll also notice the sporty leather-wrapped, D-shaped steering wheel and the extra USB port for charging multiple devices on the go, which is paired with a cargo area 12V power outlet. The GT-Line is also the lowest trim that affords you illuminated vanity mirrors – the LX and S don’t have any lighting near the mirrors. If you love that body kit, but you need more goodies and can’t afford the GT-Line Turbo (discussed later), the GT-Line also offers a $1,900 package that brings the price to $22,190 ($23,185 with destination charges). You get a lot for your money in this package: a standard-sized power sunroof, push-button engine start and stop with a stylish smart key you can keep in your pocket, a handy cargo cover that creates some hideaway storage for you in the trunk and also allows the load floor to lie flat when you put down the back seats, and an ultra-cool fast-charging wireless phone charger. With that package, you also get the Blind Spot Monitoring and Rear Cross-Traffic Alert safety systems that are standard in the Soul S but, for some reason, do not come in the basic GT-Line. Even more strangely from a packaging perspective, the GT-Line comes with the active Lane Keep Assist system whether or not you choose Blind Spot Monitoring. Note that the GT-Line does not include that center exhaust unless you move up to the turbocharged model described later. 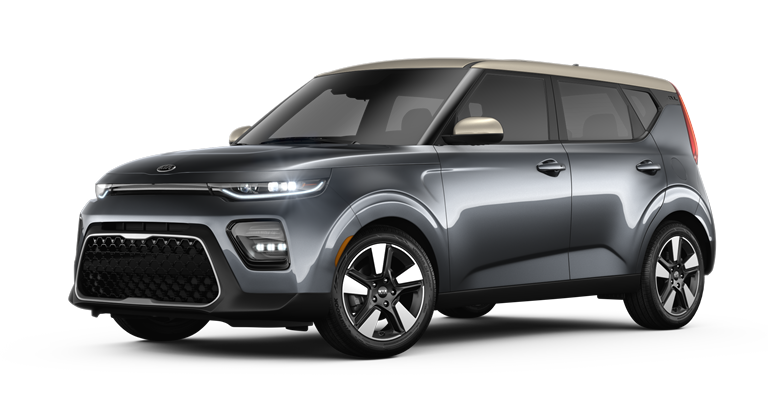 The X-Line is Kia’s attempt to bring rugged off-road styling to the Kia Soul. While there is no AWD system offered and ground clearance is identical to the other trims of the Soul, the X-Line definitely looks cool with its unique black plastic cladding on the lower portions of the car, framed by pieces of silver trim at the bottom that mimic scuff plating. The X-Line also includes some incredibly handsome 18” alloy wheels that are arguably the best offered on the 2020 Soul. While we’re still on the subject of looks, the X-Line has a compelling color palette that includes bright yellow, red, a dark green that is the closest color to the classic British Racing Green that I have seen on a modern car, and dark gray. For $345 more, you can opt for the white paint or two gorgeous two-tones: Mars Orange with a black roof and Neptune Blue (a bright primary color blue) with a black roof. The X-Line also features frosted silver side mirror covers, matching trim pieces around the lower headlights, and for the first time on a US market Soul, silver roof rails for some added practicality. You also get fog lights in the grille, similar to those found on the lower trims of the GT-Line. On the inside of the Soul X-Line, you’ll find the standard black cloth trim also found in the LX with no other interior options, which is surprising since the X-Line is more expensive than the GT-Line or S at $21,490 ($22,485 with destination charge). The X-Line is not available with push-button start, but it does come with Blind Spot Monitoring and Rear Cross-Traffic Warning. There are also no additional trim packages available if you choose the X-Line. 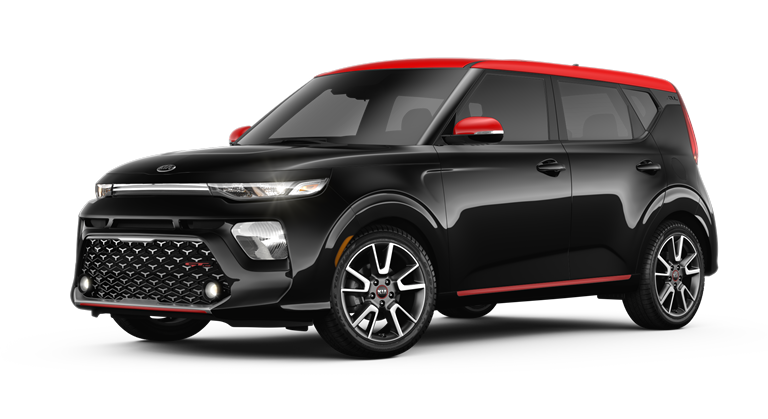 The Soul EX is perhaps the most dynamic version of the new 2020 Kia Soul. It starts at $22,690 ($23,685 including the destination fee), which is around $5,000 above the base price of the Soul LX. As you could guess, you start getting some more interesting features and choices for your extra cash. The Soul EX comes in two variations, the Soul EX and the Soul EX Designer Collection, the latter of which brings the price up by $1,500 to $24,190 (or $25,185 with destination fees). The Soul EX comes with a host of enhancements over the less expensive trims of the Soul, which is recognizable from the outside by its custom grille with a pattern of machined brightwork Kia calls “Hot Stamping,” projector beam headlights that give the lower bumper a more premium feel, LED daytime running light strips in the upper headlight unit with amber LED side markers, spotlights in the grille, and stylish gray-colored 17” alloy wheels. On the inside, the Soul EX features a wide 10.25” touchscreen with built-in navigation, a wireless phone charger, push-button start, automatic climate controls, power driver’s seat, driver and passenger heated seats, leather-wrapped steering wheel and gearshift, and in the back, a rear-seat armrest with cupholders and adjustable rear headrests (surprisingly, these are not available in the lower trims). The seats of the EX are built with the premium Tricot cloth. Opening the hatch of the Soul EX, you will find a cargo cover and a separation between the upper and lower cargo areas for a flat load floor. The EX is also offers driver one-touch auto-up/down on the power windows. It’s surprising you don’t get this on the lower trims and even more surprising that there is no passenger window one-touch auto-up/down feature. From a safety perspective, all Soul EX models have active Forward Collision Avoidance, Blind Spot Monitoring with active Lane Keep Assist, and Rear Cross-Traffic Alert. The Soul EX Designer Collection adds some attractive features such as full LED headlights with LED turn signals and LED fog lights, rear LED taillights, unique five-spoke black 18” wheels with machined silver surfaces, and leatherette-bolstered premium cloth seats. The Soul EX comes in a wide variety of colors: bright red, dark green, silver, and dark gray at no additional cost, or $345 more for white, black, or gold. The gold color offered is a light sandy color called Platinum Gold. The Soul EX Designer Collection is available with the white, gold, and black, and if you go with the Designer Collection, you can also opt for bright yellow, bright blue, or a pair of two-tone options: gold with a white roof and dark gray with a gold roof. These particular two-tone paint schemes are eye-catchingly bold and sophisticated, and are unlike anything else on the market. At $27,490 ($28,485 with destination fees), the GT-Line Turbo comes in at $10,000 more than the base price of the 2020 Soul. That’s how much you’ll have to pay to get the benefits of the 201-hp turbocharged 1.6L and the 7-speed dual-clutch automatic transmission that goes with it. However, when you do opt for the Turbo motor, you get all the tech goodies as well. In fact, there are no further options packages available on the GT-Line Turbo. The Soul GT-Line comes only in a few paint colors: red, blue, dark gray, white, and black (the white and black still requires a $345 price increase). There are no two-tone options for the Turbo. It also comes with the same GT-Line body kit and sporty 18” wheels featured on the non-turbocharged Soul GT-Line, but on the Turbo model you get the center-mounted dual exhaust that’s absent on the standard GT-Line. As on the naturally aspirated GT-Line, the Turbo generally comes with the red accented trim pieces under the front grille and below the side doorsills on both sides of the car, although it’s possible that you could find some models out there without the red accents. Other exterior features on the GT-Line include standard full LED headlights, marker lights, fog lights, and turn signals on the front, LED taillights with incandescent reverse and turn signals on the back, LED turn signals integrated into the heated side mirrors, and gloss black on the plastic C pillar window extension (the one with the extra “Soul” badge). On the inside, the GT-Line Turbo features extra red trim pieces on the doors which were not present on the pre-production Soul GT-Line Turbo that journalists drove last month. These red interior trim pieces correspond to the areas where interior ambient lighting appears, which is standard on the GT-Line Turbo. That includes the front doors, next to the climate vents as well as around the mid-level speaker grilles. The rear doors do not receive ambient lighting but still feature the red trim pieces in the same places as the front doors. By the way, that ambient lighting is far more configurable than the previous generation Soul, and features several multi-color modes as well as primary colors that pulse in time to the music. You can control the interior ambient lighting through the 10.25” touch screen, which in the GT-Line Turbo is connected to a 10 speaker 630-watt Harman Kardon sound system with a center speaker, amplifier, subwoofer, and Clari-Fi software that makes everything sound clearer and more natural. More standard interior features on the GT-Line Turbo include dual USB charging ports, the wireless phone charger, a power-operated standard sized sunroof (no panoramic sunroof is offered any more on the Soul), a larger color LCD screen between the gauges than is found on other Soul models, and a popup Heads-Up Display, which is crystal clear even when you’re wearing polarized sunglasses and provides information from your speed to your navigation directions and cruise control information. It can be hidden away at the touch of a button. Speaking of cruise control, the Soul GT-Line Turbo gets Kia’s best smart cruise control system, which includes stop-and-go with configurable distance from the car in front of you, lane keep assist which keeps you centered in your lane, and safety features like forward collision avoidance, rear cross-traffic alert, blindspot monitoring, and more to ensure that using the smart cruise control is as safe as possible. If you take your hands off the wheel for too long while using this system, you’ll get warnings until you put your hands back on the wheel. Continuing on the interior of the vehicle, the GT-Line Turbo has the dual-zone automatic climate controls with a separate screen dedicated to the climate information. It features LED lighting throughout the interior to match the LED illumination outside. And for seating, you get leatherette-bolstered cloth seats with red-stitching that’s exclusive to the GT-Line Turbo. The front seats are heated, but no cooling seats are available. You also get a heated D-shaped leather steering wheel and leather shifter, piano black accents on the infotainment screen and climate vents, and unique satin chrome door handles on the inside. The Soul GT-Line Turbo is also the driver’s car of the lineup. It has a specially tuned suspension that substantially limits body roll over the other Soul trims to match its sporty powertrain, and paddle shifters allow you to more quickly navigate through the gears on the dual-clutch automatic. You’ll also notice that the drive modes substantially change the character of the car on the GT-Line Turbo, with the Sport mode giving you the ability to shift gears quickly and leave the car in gear much longer than in the other modes. Overall, the GT-Line Turbo feels great to drive, and is lightyears ahead of the CVT-powered 2.0L motor on the lesser Soul models. 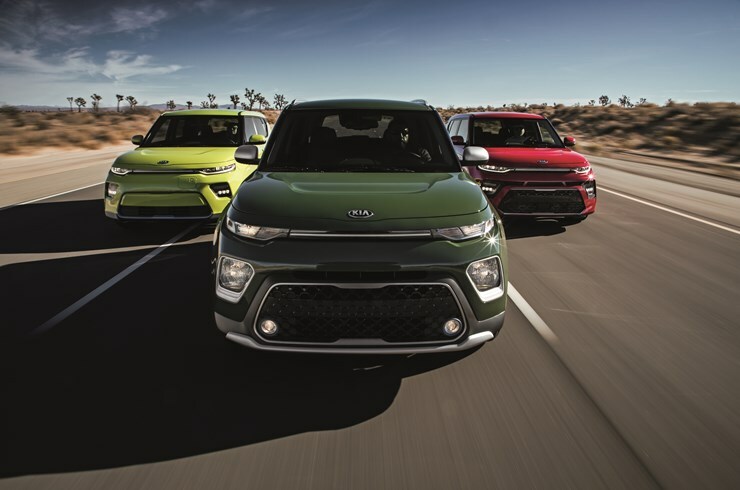 As with all other Kia models, the 2020 Soul allows you to add on some options that your dealer will install for any model you choose. Those include floormats and cargo protectors, illuminated scuff plates and additional interior ambient lighting, mud guards, puddle lamps, aluminum pedals and more. Those options are reasonably priced and range from $60 to $325 each, so none of them will break the bank. 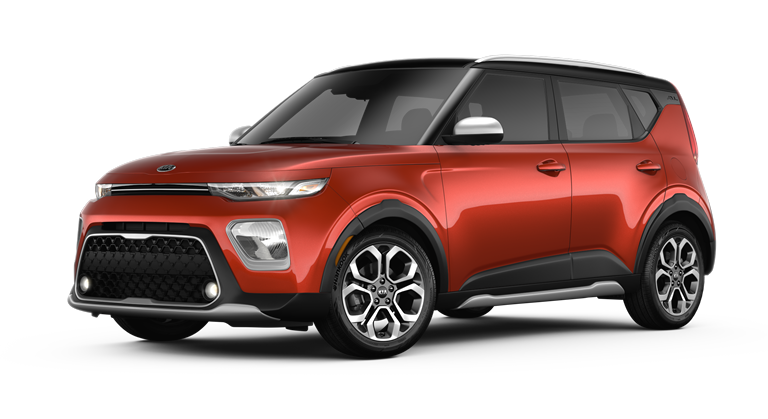 With Kia’s wide range of available combinations for the 2020 Soul, most buyers should be able to find something that catches their fancy. The only thing that makes buying a 2020 Soul difficult is compromising with yourself between what features, color combination, and powertrain you want. Remember that you can easily do certain things aftermarket, such as wrapping the roof a variant color or upgrading the sound system. It’s more difficult to swap out an engine or add valuable safety features, so take this into account. Another piece of advice I always give is to purchase a two-channel dashcam to show the front and back views while you’re driving, and think about a power management system that allows for 24/7 recording, even when you’re parked. Good luck and we hope you find the Soul that’s best for you!